Handwriting is an important skill. It is a complex skill. Handwriting is the coming together of sensory, motor, and thinking skills. When these skills are in sync, learning to write letters and numbers is fun and effective. Handwriting then becomes a tool for learning. For some children, handwriting is a hindrance rather than a help. Many times it is a hindrance due to limited instruction or hurried instruction as teachers attempt to keep up with curriculum demands. Many times, children can perform adequately with whatever instruction has been provided and can pick it up on their own. For other children, struggling with handwriting can be a sign that their skills are not in sync. In this case, identifying the underlying cause is important. Otherwise, no matter how many times they are practiced, it seems the letters just won’t stick. It may seem like they are attempting to draw the letter each time. Exploring sensory processing and motor skills or coordination is a good place to start. Why? 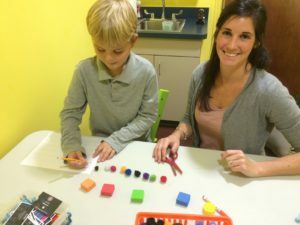 Developmentally, preschool and elementary school aged kids are still learning primarily from their sensory and motor systems. These systems then support the ability to learn higher level academic skills. Rather than thinking about writing the letter, they can think about the concepts or listen and record instructions from the teacher. Classroom performance and the joy of learning is enhanced by effective handwriting skills. For example, have you ever needed to look at the keypad or actually touch the keys to remember a phone number? Or physically retraced your steps to find something you had in your hand minutes before, but now seems lost? This is because vision, touch, and movement (or motor memory) trumped the mental memory. When handwriting works well, it makes available more tools for learning. Taking notes solidifies what is heard and seen, creates a motor memory, and provides a visual reminder of the concept and the act of writing the notes. Handwriting helps to develop skills in sequencing, organizing, and spatial skills. Cursive handwriting, because of its flow and becomes individualized (a person’s art), also helps to synchronize both sides of the brain. Some ask why not just learn to type. Typing is a fantastic skill and much needed in this age of technology. For young children, however, typing can be less efficient than writing. They are still learning to identify letters. If they are only typing, they miss the sensory and motor learning opportunities to develop strong letter identification. They are also still developing finger isolation skills which is necessary for effective and efficient typing. Reading can also be impacted by handwriting. When basic letter formation is not developed, recognizing and reading various fonts can be difficult. Many children are stumped when it comes to reading cursive when they have not been taught cursive. A good foundation with handwriting is a valuable, life long skill. Struggling with handwriting is both a symptom of areas that may not be functioning well and a method to develop these same areas. 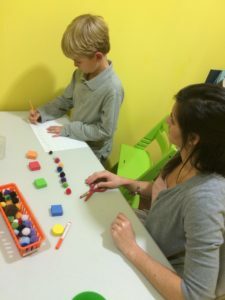 At the Lamp Post, we provide tutoring that is aimed at developing the sensory and motor skills that support pre-handwriting skills as well as the instruction to develop handwriting skills. Contact us today. We are hopeful that we can help! While there is still much to say about handwriting, we are curious. What do you think? How important is handwriting? What questions do you have about handwriting?